Bang On the Drum All Day…..
Max LOVES music. Playing music. Dancing to music. Listening to music. Singing along to music. He now requests his favorite songs. He’ll say “Row, Row! Boat!” and “Hop, Hop, Hop”. He’ll request “Down” (Ring around the rosie….all fall down). And of course he constantly does the hand motion for “Itsy Bitsy Spider” like Baubee taught him. 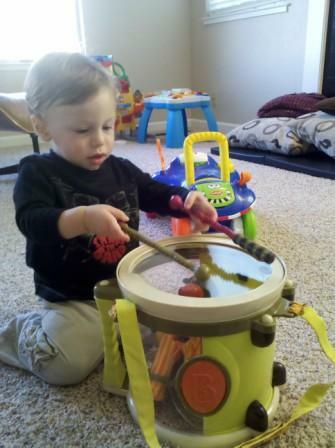 He’s even started to chime in with words when we’re singing, and he loves to pat his knees or clap along. He’ll even grab my hands and push them together and say “Clap, clap!” if I’m not participating enough. 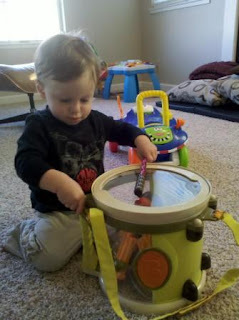 So of course we had to do our part to encourage his musical talent. 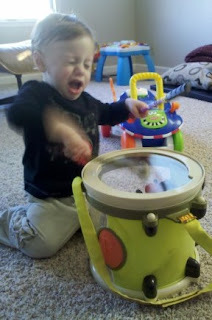 What mother in her right mind would buy her kid a drum? Ummmm…..me. He started out tapping very gently. And took his time figuring out how it worked….